Many of the findings of the Canqué study were either new, poorly understood, controversial, or unbelievable when communicated to the scientific community. Some found it difficult to accept that calories were more limiting than protein in the village diet, that 40% of village newborns had low birth weight (LBW), that the high concentration of S-IgA in human colostrum and milk protected against enteric infection, that children averaged seven or more attacks of diarrhea per year, and that children had enteric pathogens during more than one-half of their first three years of life. The most difficult postulate to understand was that the force of infection and infectious disease was the main determinant of poor health, growth retardation, malnutrition, and death of infants and young children. Such ideas conflicted with prevailing dogma, despite previous studies that pioneered the field (Scrimshaw et al. 1959, 1968). The main findings of the Cauqué, study follow. Courtship began at 14-17 years for girls and at 17-20 years for boys. Stable couples by common-law union or marriage were the rule; the few unaccompanied pregnant women were engaged. Motherhood started two or three years after union of the couple. Pregnancies usually occurred before age 20 and were spaced by two-year intervals as a result of prolonged breast-feeding and sexual restraint. The number of pregnancies averaged 12 for women 40-43 years old; the total span of fertility was 25 years. Birth intervals strongly correlated with gestational age: short birth intervals (917 months) led to more premature births than longer birth intervals (18 months or more), a highly significant difference. The association probably reflected a more limiting maternal nutrition and health when there was shorter spacing between pregnancies. It may also reflect the social practices in this group. Child-rearing expertise was acquired from older women. Most young women were slim and stunted, although weight for height was adequate for most when they approached reproductive age; some became stocky at the end of their obstetric experience (Table 1). Stunting was the result of early synergism between infectious diseases and nutritional deprivation. Almost all pregnant women were barefoot, did not observe adequate personal hygiene, and lived in an unsatisfactory sanitary environment. Therefore, a high proportion harbored enteric pathogenic parasites, bacteria, and viruses (Table 2). TABLE 1 Anthropometric Values of 171 Womena of Santa María Cauqué, 1963-1971. The diet consisted of maize-the staple food-prepared as tortillas (flat pancakes of ground lime-treated kernels), black beans, and greens, with little animal protein and an occasional fruit. It was deficient in calories, animal protein, iron, and some vitamins. Food intake during pregnancy did not meet the increased need. Women did not gain enough weight during gestation (mean 6.8 kg) and experienced several disease episodes during pregnancy. Caloric intake, but not protein intake, during pregnancy correlated with birth weight and length. Thus, mothers had been affected by infectious diseases and poor diets and were stunted. Stunting correlated with fetal growth retardation and premature birth. Data were obtained by nurses for 297 natural births occurring from February 1964 through 1973; additional data were furnished by relatives for another 111 deliveries (Mate, 1978a). The midwife, relatives, and friends were present at the deliveries. Women gave birth on their knees (90%), squatting (8%), or in the supine position (2%). Traditional obstetrics did not include shaving, disinfection, analgesics, episiotomy, or forceps. Enemas were not given, and in all but two deliveries, passage of maternal feces occurred with soiling of the newborn. External maneuvers were the rule, with an occasional vaginal or rectal exploration, without handwashing or gloves. The main role of the midwife was to support the delivering woman with words, prayers, and massage of the back, abdomen, and limbs. The nurse assumed obstetric roles on few occasions, by specific invitation of the midwife or a relative. Rupture of membranes was spontaneous in all deliveries, and birth ensued within 10 to 20 minutes (85.5%), 20 to 60 minutes (4.4%), one to 2 hours (3.4%), or 3 to 98 hours (6.6%). The duration of labor ranged from a few minutes to 19 hours (mode, four hours). The midwife cut and cauterized the umbilical cord with a hot sickle or machete, and in 72% of the cases dressed the stump with gauze and treated it with alcohol. These practices likely accounted for the virtual absence of tetanus neonatorum. Oxytocin, antibiotics, and other drugs were unknown or not available. Over 10 years, births were uncomplicated, 99.3% cephalic and 0.7% with breech presentation. No maternal deaths in puerperium were recorded. Puerperal fever and other diseases were not observed. One mother had cellulitis in the elbow and one developed psychosis-both while nursing -and they died within six months postpartum. Their infants were nursed by foster mothers and survived. The success of natural birth was remarkable when compared with hospital delivery before the sanitary revolution initiated by Semmelweis in Europe in the nineteenth century or the advent of asepsis, antisepsis, and modern obstetrics (Table 3). There were no cesarean sections or nosocomial infections and no recorded puerperal fever or similar infections, despite the lack of asepsis in childbirth. In contrast, abnormal delivery and puerperal infections are common in modern societies. In Costa Rica, more than 95% of the births are in clinics and hospitals, with 36% spontaneous deliveries, 15% cesarean sections, and 15% maternal infections (Mate, 1982a). Cesarean section was found to be associated with shorter periods of breast-feeding (Mate et al., 1988) and an increased risk of neonatal death (Bobadilla et al., 1991). More complications and deaths would occur with such sections if it were not for the wide use of broad-spectrum antibiotics and other medical resources. The newborn baby was immediately placed naked on a mat or cloth on the dirt floor, without removing the vernix caseosa. After a few minutes, the baby was wrapped in clothes. Maternal colostrum was given to only one-third of the babies. If the mother had been nursing an older child throughout the present pregnancy, she offered the breast to the newborn without delay. In many instances the mother gives colostrum to her baby. Under other circumstances a foster mother, generally a friend or relative, the grandmother of the infant as recorded in a few instances, serves in this capacity. In the first two days postpartum, the mother and baby had a 30 to 45-minute bath in the temascal (traditional sauna) accompanied by the midwife and perhaps a friend. She resumed her domestic, agricultural, and market duties within three days postpartum, carrying the baby wrapped on her front or back in intimate contact with her body. She slept with the baby to keep him warm and nursed him on demand (day and night) for months or years. Optimal mother-infant contact promoted exchange of pheromones and odor, eye-to-eye contact, and verbal communication (Klaus and Kennell, 1976). It also stimulated breast-feeding, which is crucial for optimal intake of nutrients, maternal hormones, and immune factors. The bifidus factor of human milk, along with S-IgA and lactoferrin, favored colonization of the child's intestine with bifidobacteria. The peaceful environment of home and village was supportive of such mother-infant interaction. Bonding contributed to the universal success of efficient breast-feeding for months and years, the absence of child abandonment, and the very low rate of corporal punishment of children in the village. The quietness of the home was occasionally altered by a quarrel, perhaps preceded by a fiesta accompanied by guaro (local hard liquor). Breast-feeding was considered a natural event. Approximately one-half the mothers continued to nurse while pregnant. Among women not lactating during gestation, one-third offered colostrum to their infants. Although 33% of the families owned cows (the 1971 census showed 45 cattle), there was no bottle-feeding in the village. Few families had refrigerators, and milk formula was not available. An absence of urban life, low levels of modernity, and no organized labor for women outside the home were contributing elements. Soiling of the babies with maternal feces during birth resulted in infections with pathogenic viruses and bacteria during the first days of life, which generally were asymptomatic. About one-half the mothers gave sweetened water and infusions to their newborns with the aid of a piece of cloth, but this practice did not result in diarrhea. Colostrum and milk had large concentrations of S-IgA, which, together with the bifidus flora and lactoferrin, provided an effective defense against infection (Wyatt et al., 1972; Yolken et al., 1978). Antibodies in S-IgA are resistant to digestive enzymes and remain active after transit through the alimentary canal (Hanson et al., 1975). Most women produced sufficient milk (an average of 686 g/day at three months) to nurse satisfactorily for three to six months, but quality and quantity were lower when compared to values for well-nourished Swedish women (776 ml/day) (WHO, 1985). This volume, however, may not be enough to satisfy the needs in the second trimester (Waterlow, 1981). Women experienced infectious diseases and low food intake since childhood, but most had adequate weight for height, and all lactated for two to four years. The intimate contact between the bodies of the mother and child, as it is carried constantly, the heat of the temascal baths, and frequent exposure to sunshine were factors counteracting the hypothermia of small newborns in this cool climate. The weaning foods, normally introduced at three to five months of age, were tortillas, broths, beans, and other foods of the adult diet. They were bulky, of low caloric density, and a source of microbes (Mate et al., 1976a). For instance, tortillas, relatively sterile soon after cooking, became contaminated with Escherichia coli, Bacillus cereus and Clostridium perfringens within 24 hours of storage under a moist cloth, a traditional practice (Capparelli and Mata, 1975). Lack of refrigeration and limited firewood were contributing factors. Recurrent infections during and after weaning contributed to the marked reduction in calorie consumption (Table 4). The main nutritional deficit was in calories and not in protein, as was thought in the past (Gopalan et al., 1974; Valverde et al., 1975). Dietary deficiencies were assumed to be due to low food availability in the community, until it was shown that Cauqué, children had marked caloric deficits ("dips") during attacks of infectious disease, and adequate caloric intake during good health (Mate et al., 1977; Mata, 1978b, 1979). No change in onset of definitive weaning was noticed in five yearly cohorts, reflecting the stability of this deeply rooted tradition (Figure 2) (Mate et al., 1982). Weaning age was conditioned by the interplay of maternal factors: a new pregnancy (main cause of abrupt interruption of breast-feeding), prepregnancy nutrition, and working, economic, and emotional conditions. Such child factors as size and maturity at birth, growth velocity, and health status also have an influence. Infants who grew faster in the first months of life were weaned earlier; those who grew more slowly were weaned at a later date (Mate, 1 978a) (Figure 3). TABLE 4 Nutrient Value of Food Supplements Consumed by Fully Weaned Children One to Three Years Old. FIGURE 2 Percent distribution of weaning age, in months, of five cohorts by year of birth, Santa María Canqué, 1964-1972. Figures above bars indicate the number of girls and boys weaned at given ages. Most children were weaned late, from 21 to 32 months of age. The slight increase in length of breast-feeding for the 1966 and 1968 cohorts may not be significant in view of the relatively small number of children in each cohort (Mate et al., 1982). Infectious diseases in the 1940s were very common and devastating, according to the Registry kept in the village Town Hall since 1936. Simultaneous epidemics of dysentery, respiratory disease, whooping cough, and measles ravaged the village, killed as many as 7% of the total village population in a given year (Mate, 1978a). The Canqué study revealed a formidable pressure of infection on pregnant women and children. Most women of reproductive age harbored intestinal pathogens, which infected newborns at delivery (see Table 2). In pregnancy, 31% oft he women had one episode of infectious disease, 22% had two, 16% had three, and 2% had four or five (Table 5) (Mate, 1978a). Diarrheal disease, lower respiratory infection, cystitis, pyelonephritis, and febrile bacterial infections often had deleterious effects on maternal health. Infection in the mother likely contributed to the frequency of elevated fetal IgM (Mate, 1970a; Mata and Villatoro, 1977), but no correlation was found between this and fetal growth retardation. FIGURE 3 Weight curves of two cohorts of children defined by different weaning ages, from birth to age 42 weeks, the stage of growth deceleration. Top curve: children weaned earlier, at 12-29 months. Lower curve: children weaned later, at 30-47 months. Children who grew faster in the first months of life tended to be weaned later. A similar relation occurred with body length, Santa María Canqué, 1964-1972 (Mate, 1978a). Intestinal colonization of newborns with indigenous microorganisms was rapid and efficient and originated in perinatal contamination with microflora of maternal feces and tegumenta (Mate and Urrutia, 1971). The bifidus flora, S-IgA, and lactoferrin provide a natural barrier against many intestinal pathogens that invade the neonate (Table 6). Enteroviruses and pathogenic bacteria were found in the intestinal tract of several neonates, but such infections often were asymptomatic, reflecting the effective defense conferred by immune principles in maternal colostrum and milk (Mate and Wyatt, 1971; Cruz et al., 1977). 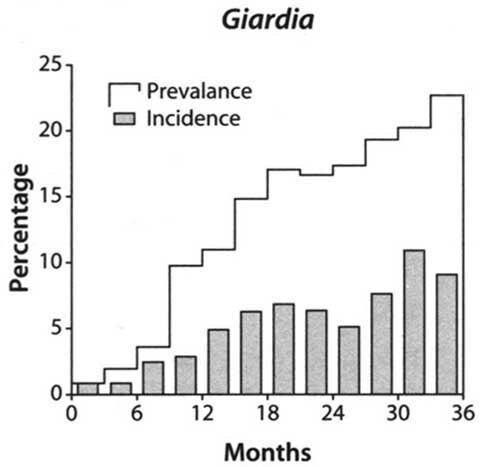 Breast-fed infants were markedly resistant to Giardia and Shigella during the first semester or longer (Figure 4). As they grew older, however, they became infected with pathogenic enteric viruses (Table 7), shigellae (Table 8), and intestinal parasites (Table 9). The indigenous flora were less protective at older ages when children were exposed to larger infectious doses acquired from weaning foods, water, and attendants (Mate, 1983a). FIGURE 4 Incidence and prevalence of Giardia intestinalis and Shigella spp., by age of child, cohort children from Santa María Cauqué, examined weekly from birth to age three years. Marked differences m incidence and prevalence were noted, reflecting the chronicity of infection with both pathogens (Mate et al., 1971; Mata, 1982a,b). Note the significantly lower rates of infection during the period of exclusive breast-feeding. With weaning, children became more readily infected, and if they were malnourished, they often had persistent infection. Infection with rotavirus was investigated by an antigen-capture enzyme-linked immunosorbent assay (ELISA) in 5,891 weekly specimens from the 45 cohort children, which had been kept frozen since 1964-1969 (Mate et al., 1983). Rotaviruses were uncommon during exclusive breast-feeding. When they entered the village, however, they rapidly infected as many as 50% of the children, particularly those 6 to 18 months old (Figure 5). Rotavirus diarrhea often was accompanied by fever, dehydration, and weight loss (Wyatt et al., 1979; Mata 1983a). Enteroviral and rotaviral infections were short-lived. In contrast, many adenoviral, bacterial, and parasitic infections were prolonged, either due to failure of the host defense to repel them or due to repeated infections. 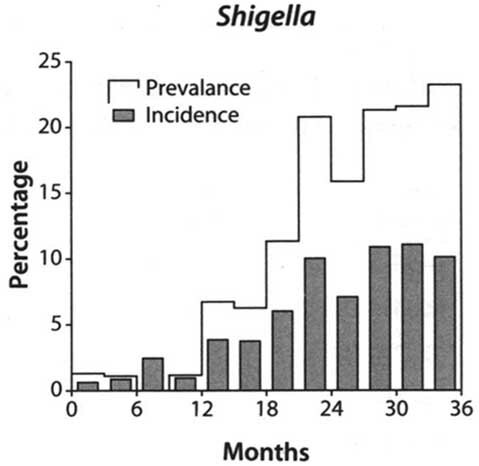 One striking example were the shigellae, with more than 50% of the infections lasting two weeks or more, and 10% lasting two months or more (Table 10) (Mate et al., 1984). The use of the immunomagnetic separation/polymerase chain reaction might increase these rates by two to threefold, as shown for Costa Rican children (Achí et al., 1995). Prolonged infections with Giardia also had a deleterious effect on nutrition and growth of Cauqué, children (Farthing et al., 1986). The 45 cohort children harbored one or more intestinal pathogens in one-half of their infant period. These were found in two-thirds during the second and third years of life. Consequently, most children had recurrent diarrhea during most of their early years of life. With regard to etiology, more than 50% of the diarrheas were associated with known pathogens (Table 11), an underestimate because in that epoch many agents had not been discovered or rediscovered. For instance, by retrospective testing, rotaviruses were found associated with 10% of the diarrheas of the 45 cohort children (Mate et al., 1983) (Table 12). Also, in the Mayan village of Santa María de Jesús, located in the same geographic region and similar in many respects to Cauqué, (see Figure 1), adenovirus types 40 and 41 were incriminated in the acute diarrheas of childhood (Cruz et al., 1990). Diarrhea morbidity, which is low during exclusive breast-feeding, increased with weaning to attain the highest rates from the second to the fifth semesters (Mate, 1975). There were, on the average, seven attacks of diarrhea per child per year in the first three years of life. The incidence was greater during weaning ("weanling diarrhea"; Gordon et al., 1963), from 6 to 26 months of age (Figure 6). Other infections were less frequent than diarrhea, but added together they were very important as causes of disease, disability, and death (Table 13): namely, tonsillo-pharyngitis; bronchitis and bronchopneumonia; thrush, herpes simplex, glossitis, and cheilitis; impetigo, abscess, and furuncle; measles, rubella, and varicella; and undifferentiated febrile illness. These illnesses were found in greater frequency during weaning ("weanling morbidity"). Complications of measles (Urrutia and Mata, 1974) and whooping cough (Mate 1978a) were common. In sum, children were ill with infectious diseases during much of their infancy and preschool years. Such a force of infection contributed to an early increase in serum immunoglobulins. By the age of one year, 95% of children had acquired the village adult level of IgG, and 99% had reached the adult value of IgM. With regard to IgA, 73% of the children had adult levels of this immunoglobulin by the age of five to nine years (Cáceres and Mata, 1974).